The Telegraph Museum is to benefit from a new round of funding just announced jointly by the Government and a major grant-giving foundation. The Museum in Porthcurno has been awarded £130,000 under the scheme known as the DCMS/Wolfson Museum Improvement Fund. 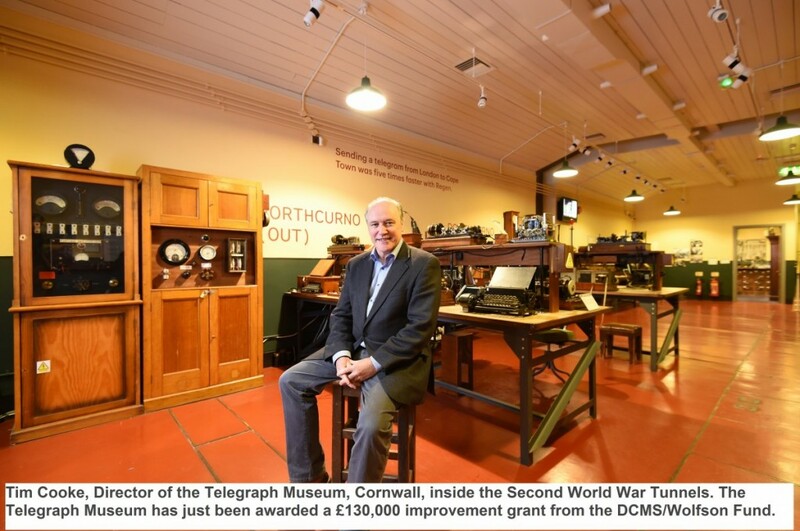 Tim Cooke, Director of the Telegraph Museum, said: “This award will allow us to build upon the fabulous £3 million refurbishment programme completed in 2014 by improving the way we tell the astonishing story of the secret World War Two Tunnels at Porthcurno while also showcasing how contemporary Cornwall connects the whole of the UK with the wider world today via its network of fibre optic cable. The Telegraph Museum holds internationally important collections and tells the story of transformational communications networks between Cornwall and the rest of the world from 1870 until the present day. Its collections hold ‘Designated’ status from Arts Council England. The Museum attracts support from the Vodafone Foundation, Arts Council England via Cornwall Museums Partnership and Cornwall Council. In 2014 the Telegraph Museum completed a successful £3 million investment programme which greatly improved visitor experience, exhibition displays and created a new learning and archive centre. That project also attracted support from the DCMS/Wolfson Fund. The Heritage Lottery Fund was a major supporter of the improvement scheme. Other funders included the Clore Duffield Foundation, Cornwall Council, Vodafone, Cable & Wireless, Garfield Weston Foundation and SubOptic. The Museum’s secret tunnels were created in 1941 to protect the vital telegraph operation from German attack. Bombs were dropped on Porthcurno by the Luftwaffe and one of the unexploded devices is on display at the Museum. The Telegraph Museum is currently open throughout the winter season on Saturdays, Sundays and Mondays between 11am and 4.30pm. From April 1st until the end of October it will be open seven days a week from 10am until 5pm.